Today is World Rhino Day. It is a day for raising awareness about the threats to the future survival of the five species of Rhino in the world today. Historically Rhinos have been hunted for their horn – which has been made into trophies in Europe, into high-status jambiya handles in Yemen and into intricately carved libation cups in China. Today, despite the fact that Rhinos are protected by international law, which makes it illegal to trade in modern and unworked antique horn, there is an active black market for Rhino horn in parts of Asia (mainly in Thailand, Vietnam, China). This market is mainly driven by demand for horn used in Traditional Chinese Medicine (TCM), particularly following recent (totally spurious) claims that it can treat cancer (N.B. it was never used as an aphrodisiac in TCM). In reality the horn has no more health benefits than cow horn or even fingernails, since it is composed of the same material – keratin. Unfortunately this fact has done little to stop the demand for illegal Rhino horn. Actually, much of the demand is probably artificial, driven by wealthy businesses stockpiling horn against future shortages as Rhinos disappear (as identified in this report on Taiwan from 20 years ago). Their actions have made the average Rhino horn worth more than a 24-carat gold ice-cream cone filled with the highest grade cocaine. So far this year 287 Rhinos have been illegally killed for their horn in South Africa alone – a figure closing in on last year’s all time high of 333. 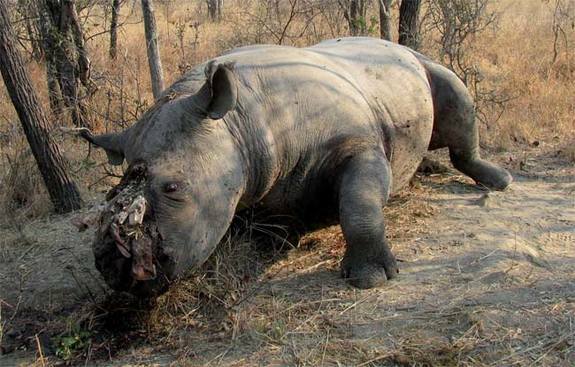 Many of these Rhinos have died from the process of having their horn removed using a chainsaw, which cuts through the flesh and bone of the end of the skull. On top of this bloody harvest, the demand for Rhino horn has led smuggling cartels to seek alternative methods of getting hold of horn. These have ranged from using Thai prostitutes to pose as legal game shooters (I kid you not) to acquiring historic horn through a legal loophole. When it was noticed that Asian buyers were paying well over the odds for antique Rhino horn the loophole was closed, but by then historic horn had become well established as a commodity and therefore attractive to the criminal element involved in the Rhino horn trade. This led to several thefts of horn from South African museums in 2010 and European targets started being hit from February 2011. Since then there has been a spate of 30 or so thefts of horn from museums, auction rooms and historic houses around Europe. These thefts have led many museums, including the Horniman, to take their Rhino horn off display and move it into secure storage. The Natural Science Collections Association (of which I am a committee member) has provided some guidance to museums about Rhino horn in collections and somehow I’ve found myself giving interviews to the Museums Association and the BBC about this issue. In the face of all the depressing Rhino horn developments over the past couple of years, it’s been heartening to see politicians and even Traditional Chinese Medicine educators backing the moves to dispel the myths about Rhino horn as a cancer medicine. I must also admit to having a (slightly guilty) sense of schadenfreude when I think of the nasty chemicals that have been used to treat Rhino horn in museums over the years (including arsenic and mercury). Risks aside, there are still rich people who will naively use ‘medicines’ that they don’t understand, but which they put their faith in anyway (Elle Macpherson for example). So the situation looks bleak for the future of Rhinos, unless misinformation about medicinal effects of their horn can be overcome and the demand for illegal horn removed. Thank you for one of the clearest exposes available on this painful subject. I’m glad you found the post useful – I expect I will be writing more in future, particularly from the museum perspective.